With some help from visiting family members, fourth grade students at Fairley Elementary School recently created uplifting projects in art class. 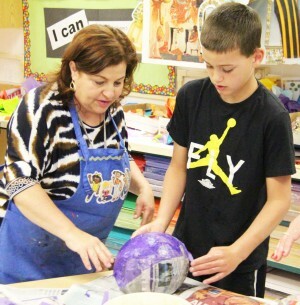 Students at Fairley Elementary School recently created paper mache hot air balloons, with help from visiting family members and art teacher Jeanette Gillett. Pictured, Gillett and student Keith Holley paste paper strips to a balloon. 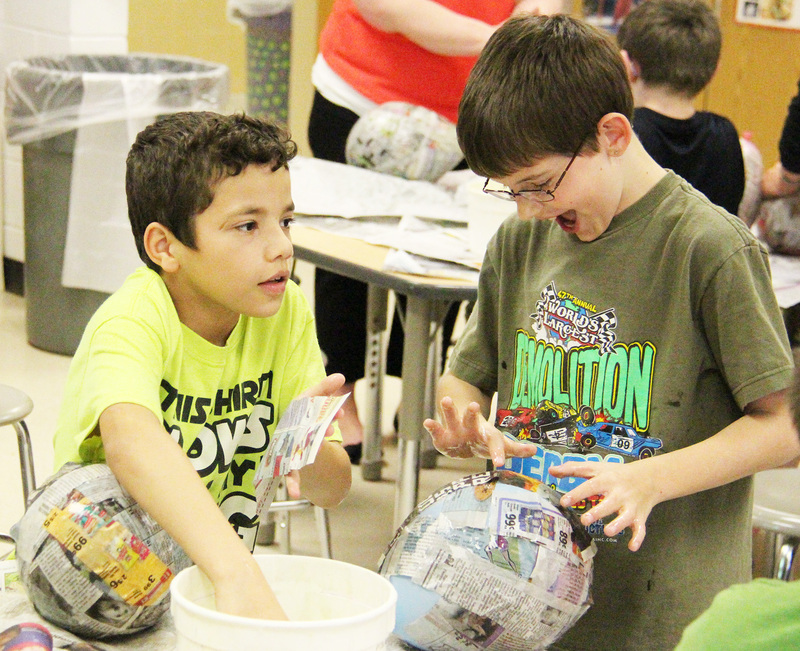 Tying in with the theme of the school’s upcoming art show, students created paper mache hot air balloons. After receiving instruction from art teacher Jeanette Gillett, students began the process of wetting strips of newspaper in glue and placing the strips on the balloon. Once the balloon was fully covered in the strips, the students selected colorful paper to place on top, much like a piñata. After letting their projects dry, the students popped the balloon, creating a hollowed out shell that resembled a hot air balloon. The hot air balloon projects will be on display at the school’s art show, titled “Up, Up and Away! Travel the World With Art,” which will take place May 19 at Fairley Elementary School. Students Tymere Ramacus and Shawn Pitcher having fun while creating paper mache hot air balloons.